Woo hoo I finally made it to Ouyen after 2 previous attempts of which the first Neil was not all that interested in coming here and the second we ended up going in the other direction to South Australia. I think it is the perfect time of the year to be around here - not too hot or too cold ... it is just right at 24 degrees. Last night we had some rain so in the morning everything was damp and since we were camped on orange sand and things were still wet everything got sand in it, on it and around it! So it was slow packing up this morning trying desperately to not get sand on everything! We left just before 9am and it was a lovely sunny morning with very little if any wind coming across from the west. We weren't expecting much traffic today but we were pleasantly surprised just how many people were going in the opposite direction to us. Very little going our way just some Kalari trucks going from Ouyen to Hopetoun carrying gysum. The terrain is a bit like what is between Hopetoun and Lascelles - rolling. Not hard riding just dropping a few gears when going up a slight rise. 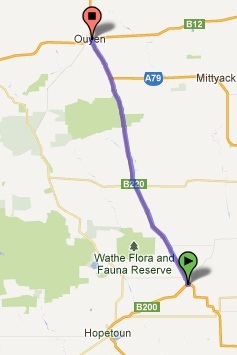 So it was like that all the way to Ouyen. There is really nothing between Lascelles and Ouyen except small rail sidings some with funny names - the funniest is Speed and believe it or not when you enter the town they always have a welcome sign and this one says Speed 'please slow down' LOL! I wonder why they named it that. The town before Speed was Turriff and that was named after a pasturalist. We made good time to get here arriving just before 2pm averaging about 16km per hour. The wind did eventually blow from a south west direction but not strong enough to blow us to Ouyen without pedalling but assisted us a bit. The campground is south of town and very nice, a little old but clean. We are in the non powered section as that is right next to the camp kitchen which has a fridge, microwave, sink, toaster and jug. Our first privately owned campground since we left Bendigo - the St Arnaud one was a council managed one.